Bullwinkle in an 2000 show. The Adventures of Rocky and Bullwinkle and Friends is a popular and influential animated series that ran from 1959 to 1964. Among the many testaments to its legacy are several live shows at the North American Universal theme parks throughout the 1990's and in 2000-01. The 16-minute Rocky and Bullwinkle Live first appeared in both Universal Orlando and Universal Hollywood during the summer of 1992. It featured costumed versions of Rocky, Bullwinkle, Boris, and Natasha. The Orlando show ran until 1993 when it was replaced with the Hanna-Barbera live show Startoons. In Hollywood, it ran until 1996 when it was replaced with a Land Before Time stage show. The only known footage of these shows can be found about 30 minutes in the official videotape Universal Studios Hollywood: A Universe Of Cinemagic. 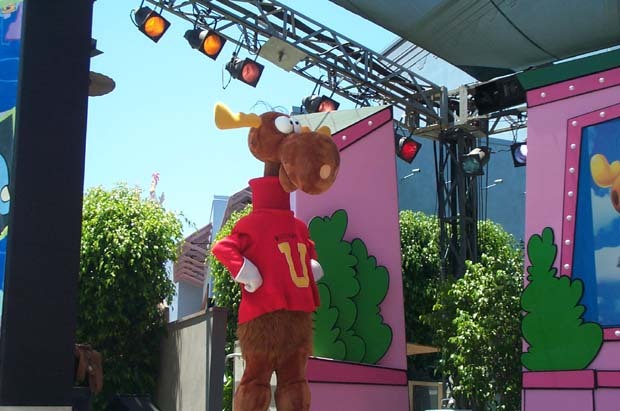 A second show ran between summer 2000 and summer 2001, in conjunction with the release of the live action/animated Universal film The Adventures of Rocky and Bullwinkle. This iteration of the show featured the Rocky and Bullwinkle costumes from the 1990's, along with a Rocky puppet and modified versions of the Boris and Natasha costumes. Only a handful of photos are known to exist, mainly from the Rocky and Bullwinkle Toonzone site, with an additional photo being provided by eBay user 20thcenturyphotos. 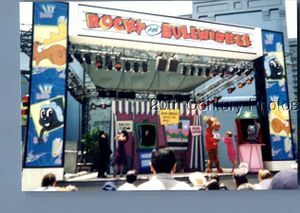 Universal Studios Hollywood: A Universe Of Cinemagic, featuring the only known footage of the 90's Rocky and Bullwinkle stage show. Boris, Natasha, Rocky, Bullwinkle and an unknown character in the 2000 show.